Rare move in S&P 500/VIX ratio. Did we just witness the mother of all breadth-based signals? The VIX (VIX) measures the market’s expectation of future volatility. We can think of the S&P 500/VIX ratio as a way to track confidence in stocks and earnings relative to confidence the market will be volatile. The S&P 500/VIX ratio is currently in the process of trying to complete a relatively rare longer-term shift. Number Two: The intermediate-trend failed to flip back in favor of stocks (MACD black stayed below MACD red). 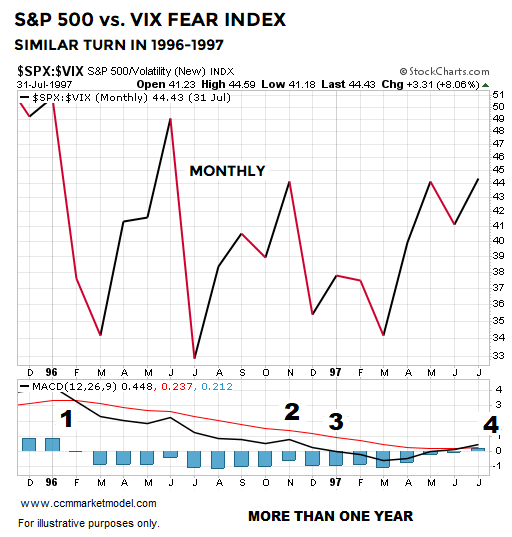 The VIX is a relatively new instrument; thus, our study period only dates back to 1993. How many times has the S&P 500/VIX ratio been able to check all four boxes over a 365-day period or longer? The answer is four times. The 1996-1997 case is shown below. What Happened Next In The Stock Market? The table below shows S&P 500 (SPY) performance after all the boxes had been checked in each historical case. 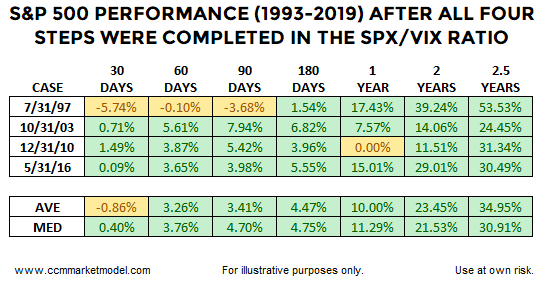 Returns had a positive bias over the first 90 days, but the 1997 case reminds us givebacks, corrections, and retracements are a normal part of all trends. Given our longer-term approach, the more relevant outcome in the historical cases was the market’s longer-term performance. All four historical cases posted positive returns 2.5 years down the road with the average and median gain exceeding 30%. This week’s stock market (VTI) video looks at a rare move that took place between 12/24/2018 and 04/08/2019 and asks how many times has this taken place in the past and what happened next in the stock market? There is nothing magical about the S&P 500/VIX ratio. However, it is another example of something that just happened in the present day that was followed by favorable long-term results in the stock market (VOO), telling us to keep an open mind about the possibility of better than expected outcomes in the coming months and years. 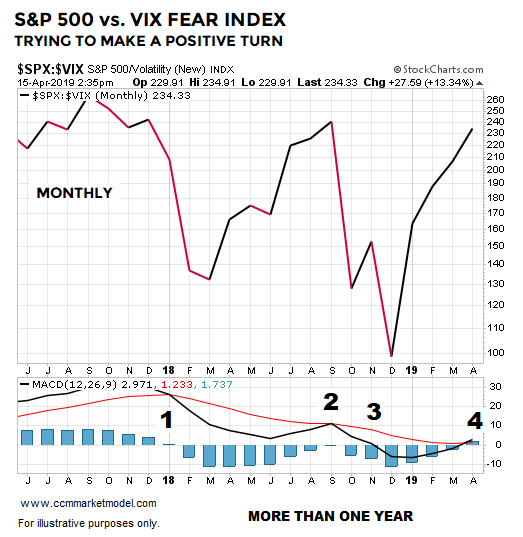 Given it is only April 15, the look of the 2019 S&P 500/VIX chart must carry into month-end; something that falls into the TBD category.